Medium spicy, chunky salsa verde - green sauce Embasa with tomatillos, chiles, onion, garlic and cilantro. Tomatillos - These are green tomatoes or husk tomatoes, known in Mexico as "tomato verde" or "tomatillos." Vine-ripened in the tropical Mexican sun, they are not unripe tomatoes. They are, however, an indispensable item in Mexico's cooking - there would be no salsa verde (green sauce) without them! Practical and high yielding in the kitchen, their main use is for blending or chopping in sauces. Salsa verde Embasa picante mediano con tomatillo verde, chile, cebolla, ajo y cilantro picados. The image on the website shows a can of crushed tomatillos. 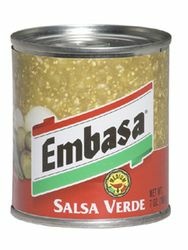 However, the product delivered is a can of Salsa Verde, which contains tomatillos, but also onion, garlic and chiles. If you are looking for pure crushed tomatillos, this is not it.